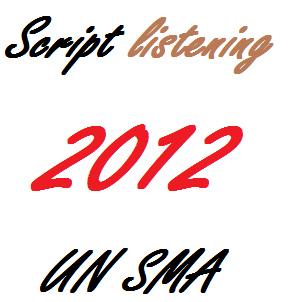 Completing listening materials, the script of audio tape listening SMA 2013 has been posted, and now we have the listening test script for 2012. To practice listening test, you should have the audio test and the test book (soal). For the audio MP3 file, you can download here and for the test book, you can see here. To make listening test practice easier, you are recommended to have the audio transcript. Meanwhile the first two materials have to be in hand, the third is used as reference when you get some difficulties in doing the listening practice. And here we go,the transcript of listening section for SMA 2012. In this section of the test, you will have the chance to show how well you understand spoken English. There are four parts to this section with special direction for each part. Directions: In this part of the test, you will hear some dialogues and questions spoken in English. The questions and the dialogues will be spoken twice. They will not be printed in your test book, so you must listen carefully to understand what the speakers are saying. After you listen to the dialogue and the question about it, read the five possible answers, and decide which one would be the best answer to the question you have heard. Now listen to a sample question. Man : We are almost out of cereal. Woman : I know. I will go to the grocery store to buy some more. I will also get some milk, bread and fruit. Man : Would you get me some instant noodles? Narrator : What does the man want the woman to buy? The best answer to this question is "Noodles". Therefore you should choose answer (D). Man : Excuse me. Is there a grocery store around here? Woman : Yeah, there is one near here. Man : Can you tell me how to get there? Woman : Sure! Go straight down this street for two blocks. Turn left when you get to Maple street. Stay on Maple street for half a block. It’s on the left-hand side. Narrator: What is the woman doing? Woman : Why didn’t you answer my call? Man : Did you call me? When? Woman : Around 18 in the evening. Man : Oh, I was already in bed. I felt very exhausted after working in the garden from morning till afternoon. Narrator: When did the woman call the man? Dad : I heard you passed your exam with flying colours. I’m very proud of you! Daughter: Thank you dad! I got 10 for Math and Biology. Narrator: What is the topic of the conversation? Woman : Thank you very much for the beautiful book, Mr Sugeng. It was very nice of you to remember my birthday. Man : It was the life I could give you. I hope you like it. Narrator: What is the dialogue about? Directions: ln this part of the test, you will hear some incomplete dialogues spoken in English, followed by four responses, also spoken in English. The dialogues and the responses will be spoken twice. They will not be printed in your test book, so you must listen carefully to understand what the speakers are saying. You have to choose the best response to each question. Now listen to a sample question. Man : May I taste the caramel pudding you just made? Woman : Of course you may. How does it taste? Narrator : What is the most appropriate response for the man to reply? A. It is very expensive, I think. B. It’s very delicious. I really enjoy the taste. C. I think I will cook it myself. D. I don’t think I’ll come with you. Narrator : The best answer to the question "It’s very delicious. I really enjoy the taste" is choice B.Therefore, you should choose answer B. Man : Hi, Debby! Thank you for the book you gave me. Woman : Don’t mention it. Do you like it? Narrator: What is the man probably answer? B. Yes. I image reading it. C. I like the way you treat me. D. Sure! Absolutely, you are right. Man : I really made a mistake. Man : I have broken your pen. Woman : That pen? Oh, no! Narrator: What is the man most likely reply? A. I’d love that pen. C. I’m proud of you. Man : Do you want me to carry these books to your room? Man : Let me bring your bag, then. Narrator: What is the woman probably response? A. My bag is black and big. B. I will go to the teacher room. D. It’s a hand-made leather bag. your test book, and decide which one would be the most suitable with the dialogue or monologue you have heard. Woman : Did you come to our school reunion last night? Man : No. I had a surgery with some fellow doctors in the emergency room. Did you go? Woman : Yes. I met so many old friends there. Bill is a lawyer. He works for his own both firms. Edward is a Math teacher in Houston. John is in the Army, and his Brother, Jimmy, is a pilot. Narrator: Which picture shows the man’s occupation? Man : Have you cook the rice, honey? Woman : Not yet! I think we need a new gas stove. This old one is not work very well anymore. Man : Okay, then. Let’s buy one, then. Narrator: Which picture shows what they want to buy? Man: This animal have a pair of wings. It is active at night. And it’s sleep during the day. People regards the animal as a manifestation of Dracula. It has broad-round eyes and sharp fangs. This animal can be found in the cave hanging upside down. Narrator: Which picture goes to the monologue? Man: I love gardening. I have a small garden in my backyard. There are daffodils, Cambodian flowers, orchids, red roses and white lilies. My oldest daughter, Annisa, is crazy about red roses. She always help me watering the flowers in the afternoon. I love all my flowers. Narrator: Which flower does Annisa like? Directions: In this part of the test, you will hear some monologues. Each monologue will be spoken twice. They will not be printed in your test book, so you must listen carefully to understand what the speakers are saying. After you hear the monologue and the question about it, read the five possible answers and decide which one would be the best answer to the question you have heard. (CNN) - A major snowstorm slammed the East Coast and foiled the busy holiday travel season as airports shut down the runways, rail services was slowed and bus routes were suspended on the last weekend before Christmas. Three deaths in Virginia were blamed on the storm, state officials said. One person was killed late Friday in a single-car crash. Two other deaths were reported Saturday as there was more heavy snow than expected. What is the monologue about? How many casualties were there in the incident? The anaconda is the largest snake in the world. Also known as the Water Boa, this giant, meat-eater lives in swampy areas of tropical South America. It spends a lot of time in shallow water, hidden from unsuspecting prey. Anacondas are related to boa constrictors. They give birth to 20 to 40 baby snakes at one time. Like all snakes, anacondas are cold-blooded; they have the same temperature as the environment. They continue to grow all their lives, getting bigger and bigger each year. The longest anaconda ever found was 11.4 m long, there are probably even bigger anacondas that have not been seen. Anacondas are greenish-brown with a double row of black oval spots on the back and smaller white markings on the sides. How many babies does an anaconda give birth at one time? What do you think, after reading the script, the test of listening seem easier, isn't? So practice more, listen to English more because it is the only best way to increase our listening comprehension skill.